Michael Mina’s shrine to carnivores is also the hippest new watering hole in town. There are ordinary hotel bars and then there are The Hotel Bars. Bourbon Steak in the Four Seasons is one of the latter. Unlike the stodgy steak joints of past, Michael Mina’s newest venture in DC is modern, hip and ridiculously decadent without being stuffy. Its holiday debut in December and the Inauguration rush in January have kept the establishment buzzing along nicely in a troublesome economy. Judging from the nightly business now, it’s still busier than ever. A dining room is overflowing with the sort of power lunches once expects from Washington, DC and everyone from Hill staffers to young professionals are arriving after the 5pm whistle. The scene-driven bar at Bourbon Steak deviates from the average with a sleek look and feel. It’s normal to find the lounge busy on say, your average Wednesday night. However, plan accordingly and perhaps you can work a rendezvous with a big cocktail and a little food at a coveted table in the lounge. We were intrigued by lobster corn dogs and black truffle popcorn on the unique lounge menu. People swear by the Kobe beef tartare. But what you’re most likely to hear patrons ooh-ing and aah-ing over is their high end hamburger. The oak-fired prime steak burger is ten ounces of perfection, cooked the way you like it and well worth the $19 price tag. Warning: don’t attempt to choose between the duck fat fries or the truffle mac n’ cheese. Just order both. 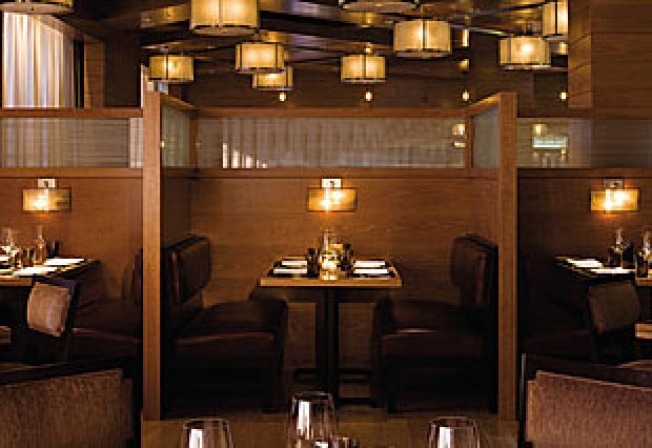 The next time your day has been too long, step inside the bar at Bourbon Steak. Loosen that tie, saddle up to the bar and get ready to leisurely nurse one of the coldest martinis in town.